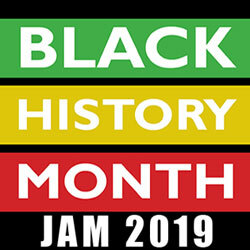 The Black History Month Jam 2019 aims to highlight the achievements of Black History in video game format. The rules are simple, make a video game between 5 am Feb 1st 2019 - 9 am Feb 22nd 2019, that is based on Black History. You can retell a story or make your own story, feature heroes from the past, present or create new heroes for the future! While it is a Black History Month Jam, all races are invited to participate in the game making goodness! 1. The game must show the positive sides of Black History, either in the past, present or future . 2. The game must NOT attack another race, NOR show Hate Crimes of any sort. 3. Profanity, vulgar language, and explicit images of any sort are NOT allowed. 4. Keep the games at an ESRB rating of 'E' or 'E 10'. 5. Have Fun and Jam On! The reason the Black History Month Jam is only 3 weeks, instead of 1 month, is so that we can have a week to play the finished games during Black History Month. Please share this Jam with all of your Friends and Family!